You rest on the table while a padded harness focuses the gentle force along your spinal column. Simply described, this method of treatment uses a therapeutic table that is connected to a computer, to electronically stretch and decompress your spinal structures. You rest on the table while a padded harness focuses the gentle force along your spinal column. This decompresses your spine specifically the intervertebral discs, joints and stretched your spinal muscles, the three structures that produce most of your pain. Prior to beginning treatments, we evaluate you to determine if you are a candidate. Your medical history, x-rays, CT/ MRI scans are carefully reviewed. If you are a candidate for therapy, an individual treatment plan is created for your specific needs. A typical plan may be between 10 to 30 treatments. It is important to complete your treatment plan and thus the full healing process even if you start to feel improvement early on. It is not uncommon to experience a significant reduction in pain early in your treatments. The computer is programmed in accordance with your specific treatment plan, and your session commences. At the beginning of each session, you are fitted with a comfortable harness designed to offer optimal decompression, unloading due to distraction and positioning. You are fully clothed, and a specially trained technician will make sure that you are properly positioned for comfort, safety and effectiveness. The computer is programmed in accordance with your specific treatment plan, and your session commences. Additionally, you are in complete control and can shut down the treatment session at any time if discomfort should occur. During each session, you experience multiple cycles of treatment, which may take 15 to 20 minutes to complete. Each cycle takes between 3 to 5 minutes. The equipment is designed to apply precisely-controlled tension along the axis of your spinal column, creating decompression of the intervertebral discs. The process is fully automated and administered by a computer, which in turn is monitored by a technician. During the treatment cycles, you may feel some relief of the pressure in the area where your pain exists. During this time, your body is responding by flooding the area with valuable oxygen, blood, and nutrients that help promote the natural healing process of your body. Schedule your initial exam today and find out if Spinal Disc Decompression can benefit you! Decompression is oftern used to treat carpal tunnel syndrome. 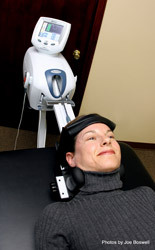 Impact Rehab & Wellness is pleased to provide the DTS Spinal Decompression System. Spinal Decompression Therapy is a revolutionary non-surgical treatment for low back and neck pain and disc herniation. Spinal Decompression Therapy works by restoring proper function to an injured disc. Producing a controlled, mechanical traction on the spine using our Triton DTS Decompression Table does this. During the pull phase, injured discs are gently stretched apart, producing a suction force inside the disc. This draws disc bulges and herniations back into the center of the disc along with oxygen, water, nutrients, and other healing substances. The end result is a strong, healthy, properly functioning disc in about 84% of the patients. Information on this tab has been provided by Triton DTS. Call now for a no-obligation consultation.